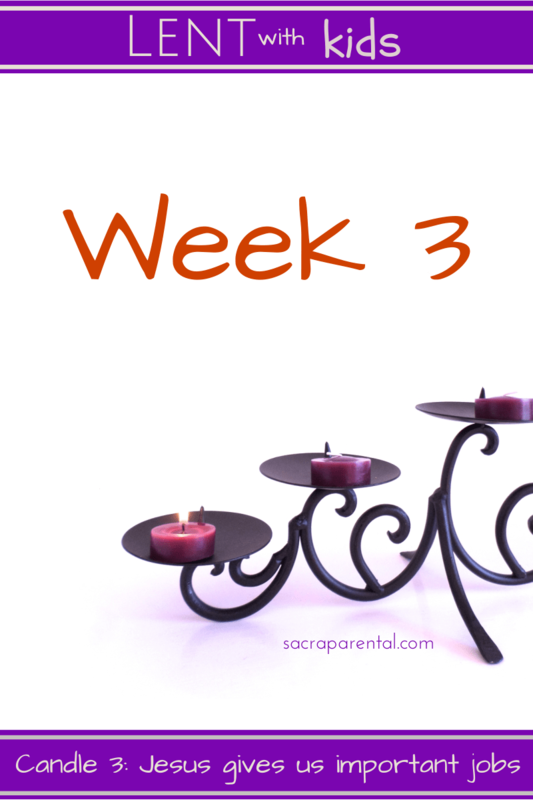 This is an all-in-one post for Week 3 of our Lent with Kids plan. To fill in some background, start here. You can also see the series index here. One of the things I love about the Montessori philosophy is that kids can make do meaningful work. Give kids brooms and cloths to match their size, and instead of playing at housework, they can actually do some. Children love to help. The good news of Lent this week is that when Jesus came to spend a few decades with humans, one of his main goals was to enlist us to join his team and do meaningful work with him. It’s sometimes called ‘building the kingdom of God’ and it’s about each of us doing our bit to make the world better, little by little. If anyone could do this job without help, Jesus could, right? And yet God chose to partner with frail, failing, finite humanity to take the slow, teamwork route, rather than just waving a magic wand. This week’s story shows how anybody can do an important job for Jesus. It is a good one to act out if you have kids of the right age to follow adults doing it, or who can read and act it themselves. Now, as I unpack below, there are some quite adult themes here, of racial tension, adultery, and social isolation. This story probably isn’t in your children’s Bibles. 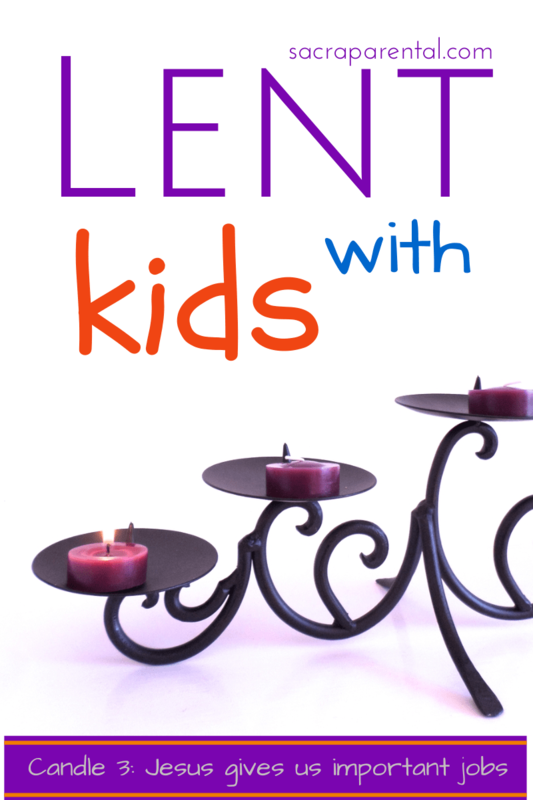 You might like to abridge it to make it age-appropriate for any kids you are doing Lent with, or you might like to instead read or act out the story of the Good Samaritan in Luke 10. Like most of the Bible, a bit of background knowledge is essential to get some of the points John (telling the story) and Jesus (in the original conversation) are trying to make. The two key pieces of information we need to understand this story are that a) Jews and Samaritans were on bad terms with each other, and b) the cultural convention was, roughly, that men and women were not supposed to speak to each other in public. 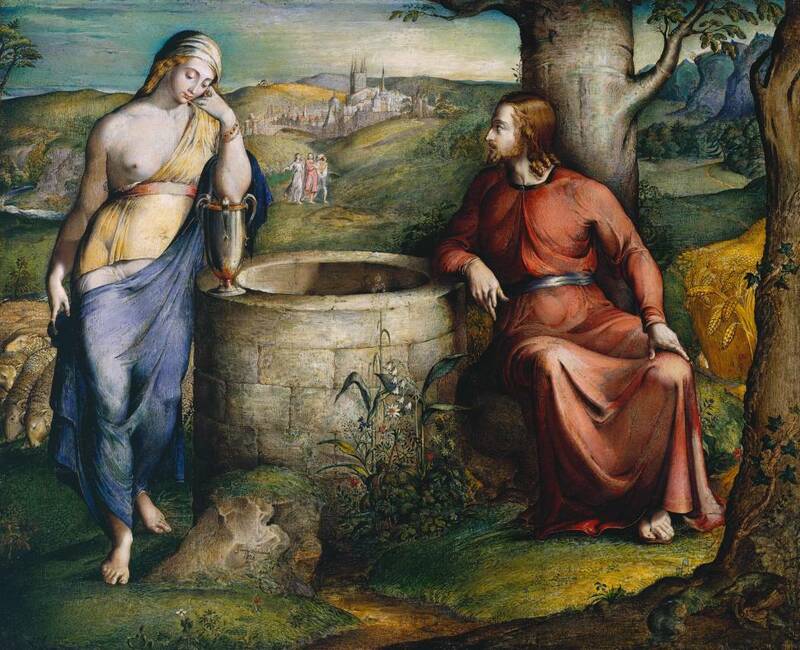 So Jesus breaks some serious social taboos to engage this woman in conversation. Not only is she an enemy, a woman and a stranger, but she’s socially isolated by her de facto relationship. This is who Jesus approaches, asks for help, engages in conversation, challenges, and then reveals himself to. This is supposed to shock and astonish readers – as it shocks Jesus’ disciples. Christ and the Woman of Samaria, 1828, George Richmond, at the Tate. She then does an early version of ‘spreading the gospel’: telling people that Jesus has changed her life, and that they should come and meet him, too. An outcast, low-status woman takes on a hugely important job for Jesus and does it so effectively that many of the villagers join the team and partner with Jesus too. So what does Jesus want you to do this week and this year? What important job might Jesus have in mind for the people in your household? That’s the big question of the week. 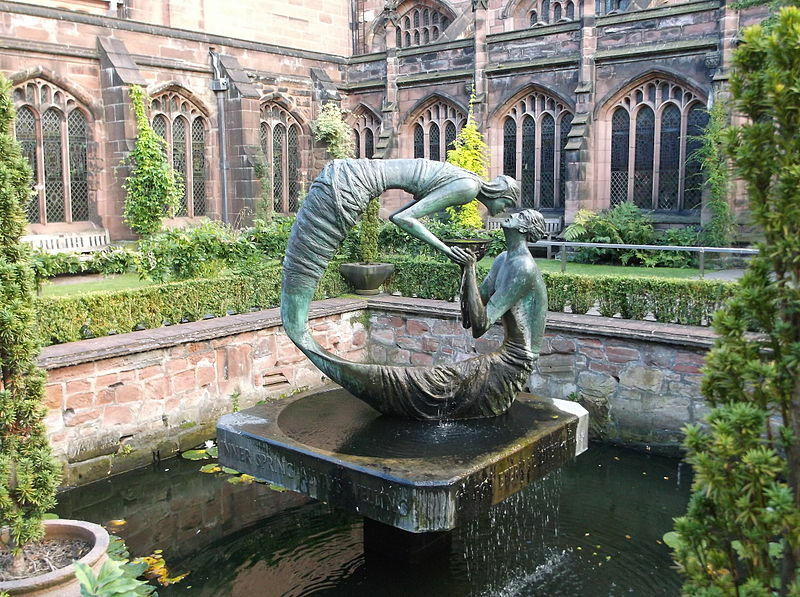 Bible reading: Jesus and the woman at the well, John 4 (or alternatively, the Good Samaritan in Luke 10). You might like to act it out together so everyone gets the idea of who was involved and what they were doing. Spiritual Practice: Drawing on the last fortnight of practising wisdom and bravery, the challenge this week is to pay attention or to listen to your life to try and hear from the Holy Spirit what important jobs Jesus might have for you. Talk at mealtimes about opportunities that come up and ways we can each make a difference and do something for Jesus. Prayer: ask Jesus to give us jobs to do, and ask the Holy Spirit to show us what they are and give us everything we need to do them. Artworks to look at together: Pick something from this list at Textweek.com – a great reminder that churches all over the world are contemplating this text this week, or head to this Orthodox site with a few pieces to discuss. Poem: I don’t have a suggestion this week (I have been too busy fighting #everydaysexism on the blog!) but I like that this heading is here. Any ideas to share? Art and craft: Water play! Also, one important job that littlies are often good at is being kind and friendly to people who need it. Why not talk together about someone you know who might need some cheering up or a nice visit. Make a card or picture or batch of muffins (or anything) together and make someone’s day – for Jesus. Hospitality: Next weekend is Neighbours Day in New Zealand and Australia (and elsewhere?) – a great opportunity to do the important job-for-Jesus of making your community relationships stronger and more loving. Check out Anna’s story of doing a Neighbours Day afternoon tea last year. Movies: Lots of kids’ movies have children doing significant, important jobs. Ideas? Pop your suggestions in the comments below. Games: Have you heard of the ‘Random Act of Kindness’ movement? Search Pinterest for that phrase and you’ll see heaps of ideas for how kids can do kind things that will help other people, often anonymously or at least unexpectedly. Maybe you could scroll through together and pick some to do as a fun household activity. Reading for adults: A one-paragraph extract, ‘Life itself is Grace‘ by Frederick Buechner, to remind us that we can hear from God – including our team assignments – in the everyday, if we listen properly. And I’d love to hear how it’s all going! Please pop a comment below if you are finding Lent to be a useful time for you or your household. Let’s encourage each other.